Dimensions (HxWxD): 1.4" x 1.4" x .4"
This stunning 1.4" long gemstone quality 99% water-clear Aquamarine Heart Pendant, weighing 3/4 ounce, or approximately 80 carats, was created by Lawrence Stoller, critically-acclaimed artist and crystal cutter who is known world-wide as a fabricator of magnificent works of art created in partnership with Nature & Light. 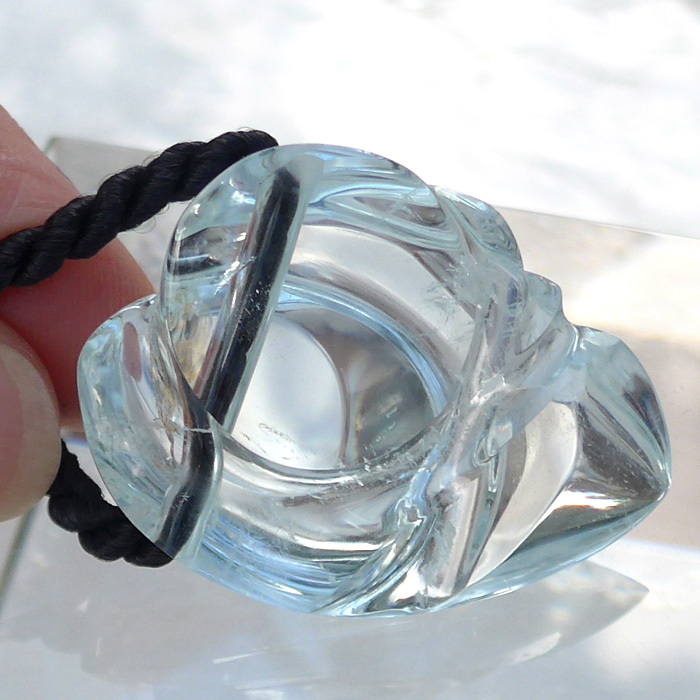 Lawrence's pendants are known for improving upon Nature's design. 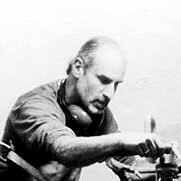 Lawrence's work is in worldwide museums & collections. He has created a magnificent centerpiece for American Express's Eleven Tears World Trade Center Memorial. He thinks of crystals as "frozen light" and indeed this Aquamarine displays amazing clarity and translucence. 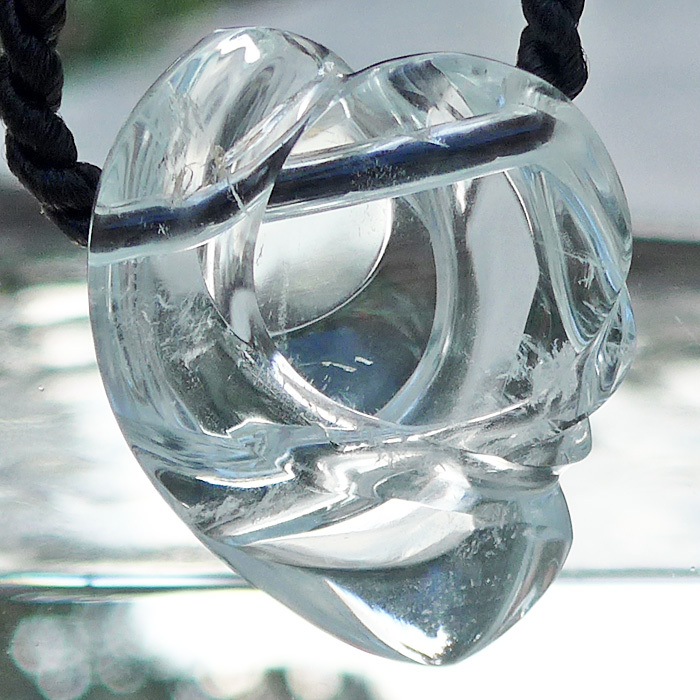 Lawrence fashioned this beautiful Aquamarine Heart Pendant as a gemstone artwork. This gorgeous pendant has been cut and polished to create a unique artistically rendered form reminiscent of the best Art Deco style, and exhibits the translucence and glowing aquamarine blue coloration that connoisseurs of gemstones prefer. To showcase the subtle beauty of this gemstone artwork, Lawrence preferred to avoid any type of metal finding, bale or basket, simply drilling a small hole in the female end of the crystal for a chain or cord. Lightworkers and crystal healers say that aquamarine is an excellent stone for communication. Because of its blue-green color, aquamarine is associated with the throat chakra, which is said to be blue or turquoise in the Western chakra system. Aquamarine stimulates, energizes, and cleanses the throat chakra, facilitating communications activities of all kinds, and strengthening the connection between the throat chakra and the third eye chakra, infusing our communications with the wisdom and love found in the Higher Self when the third eye is fully activated. This highly prized gemstone stimulates the powers of the intellect, enabling the bearer to comprehend the "big picture" in any situation, to visualize the system of inter-connected relations that inform seemingly simple situations and relationships with a deeper meaning. Aquamarine also mitigates some of the negative qualities of the intellect and rational mind such as overly critical thinking by reinforcing the connection with the Higher Self while clarifying mental activity of all kinds. It is a stone which encourages flow, balance, protection & clarity, attuning us to spiritual worlds while enhancing the connections between our intellectual, emotional and spiritual bodies. The pendant comes with a simple black cord easy to replace with your own chain or choice, recommended by Lawrence to complement the elegant design of this unique pendant. Note: weight above is shipping weight. Actual weight is approximately .75 oz. or 21.3 grams.